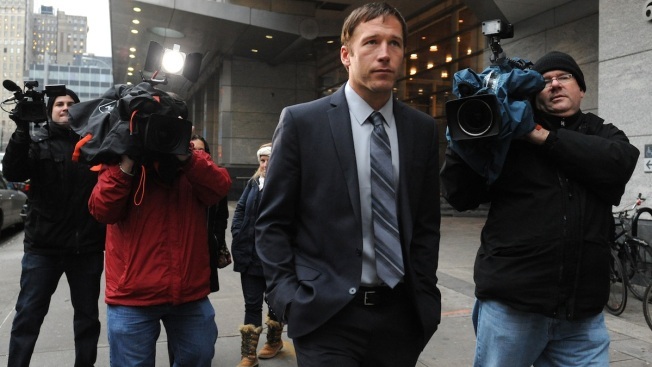 Olympic skier Bode Miller exits family court, Monday, Dec. 9, 2013, in New York. Miller and former flame Sara McKenna have agreed to share time with their infant son for four months. The temporary pact is in place until at least a March 31 court date. The temporary arrangement isn't the final word in a custody clash that has become a public drama for the skier and a cause of concern among women's rights activists. But the pact is in place at least until a March 31 court date, and lawyers for both sides said they hoped the dispute could be resolved. In the meantime, "we're psyched about the cooperative plan," Miller said outside a family court in Manhattan, where he'd traveled after a strong second-place finish in the men's World Cup giant slalom Sunday in Beaver Creek, Colo. The 9-month-old boy's mother, former Marine and firefighter Sara McKenna, also said she was happy about the arrangement. "I think we're on the right road," she said after court. Miller, 36, and McKenna, 28, had a brief relationship last year in Southern California, where they lived and the alpine skiing gold medalist still does. He's now married to professional volleyball player Morgan Beck. He filed California court papers claiming paternity of the boy in November 2012, while McKenna was pregnant. The next month, she moved to New York to go to Columbia University to finish her bachelor's degree. She gave birth in February to the boy — she calls him Sam, while his father calls him Nate — and filed for custody in New York. Manhattan Family Court Referee Fiordaliza Rodriguez sent the case back to California in May, calling McKenna's move "irresponsible" and "reprehensible" and suggesting it was motivated by the generally longer extent of child support payments in New York than in California. Women's advocates said McKenna had been penalized by the New York judge's decision, which they said would wrongly let fathers-to-be dictate where pregnant women could live. A New York appellate court overturned the ruling, leading to a Nov. 25 court date that put the boy in McKenna's care for the last two weeks.